Are you wondering what your options are to fix your crooked teeth, and finally obtain the smile of your dreams? Well, you no longer have to wonder about your options. Instead, just come see our Fairfax cosmetic dentists to choose one of our many adult orthodontics options . You and your family no longer have to worry about ruining first impressions because of your unsightly, crooked teeth. With Invisalign® clear braces, patients can love their brand new smile filled with healthy, straight teeth! Invisalign clear braces are a perfect solution for both adults and teenager who are sick and tired of their crooked teeth. You can also choose Invisalign Express® for an accelerated approach to getting straight teeth. Dr. Rayek and his team of highly trained and skilled professionals will determine if you are a good candidate for this accelerated teeth-straightening approach. 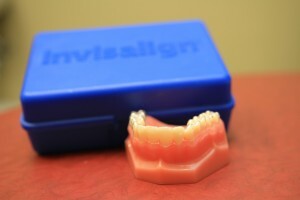 Invisalign has proven successful time and time again as an effective adult orthodontics option. Our patients continuously thank us for creating the smile of their dreams, and giving them the self-confidence that they’ve always wanted. When you come in for your consultation, Dr. Rayek will discuss the cosmetic dentistry treatment options that will create the smile you crave. He will also ask you about how you envision your dream smile, and this will help him develop a treatment plan to create your amazing, healthy smile that will last for many years to come. After Dr. Rayek assesses the severity of your teeth and bite, he will be able to determine if you can fully benefit from Invisalign clear aligners vs. metal and wire braces. If so, you can look forward to getting the smile you crave in a lesser amount of time than you would with traditional braces. Now who can refuse that? Straight teeth can do wonders in your life! Have you ever thought about how important your smile is when meeting a person for the first time? Whether you are closing an important business deal, or going on your first date, your smile speaks volumes about you. Here at our office, we understand the importance of a healthy, breathtaking smile, and we’re here to help you achieve just that! When your teeth become straightened with Invisalign, your self-confidence and self-esteem are sure to experience a boost! Straight teeth can also minimize the chances of critical smile problems in the future since you will be able to brush and floss them efficiently and more easily. With clear braces, our patients have the opportunity to experience all of these benefits, and so do you! Get your teeth straightened today with Invisalign! So what do you think? Are you ready to make a positive change in your life by straightening your teeth with adult braces by our cosmetic dentists? If so, Dr. Rayek encourages you to call our office at (703) 997-0928 to schedule your consultation appointment today. Our cosmetic dentists are more than ready to provide unparalleled, comforting patient care, while they create the smile you crave!